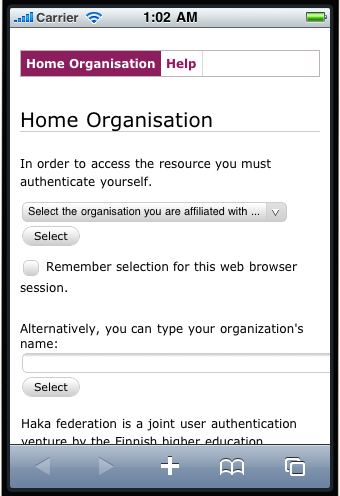 After your mobile site starts look complete in a development browser (e.g. desktop Firefox+Firebug combo) then it is time to begin testing it in actual mobile browsers. This blog post gives you introduction and some general tips for mobile browser testing. Each platform (iOS, Android, others) are dealt separately in the future blog posts, so don’t forget to follow. Like with desktop where you test your site across browsers you need to test the mobile site in different mobile browsers. The testing is important because mobile browsers use different browser engines and different engine versions. Thus, sometimes output differences are expected and you need to iron out the ugliest issues. The major mobile browser engines are WebKit on Safari/Android, Opera (Presto) and Firefox (Gecko). You luckily could say that mobile Internet Explorer’s market share is so minor that you might want to bother for it currently. Microsoft is constantly improving its mobile browser, but currently it is not in a state to match the competition in feature wise and we’ll look forward to see what Windows Phone 8 will give us. The good news are that if the mobile browser support CSS3 media queries, as used in the mobilization strategy of this tutorial, then they are likely to have very good support for HTML5, CSS3 and other modern goodies. The fixing and workaround work found during the testing is usually less than what it takes to make the site run older Internet Explorer. If you need to define compatibility list of browsers e.g. for an offer I recommend use this jQuery Mobile mobile browser grading table. It gives you an overview how “good” mobile browsers are. If you aren’t a mobile developer you might not have access to a real test device repository. Luckily, the simulators by the mobile vendor themselves are pretty good nowadays and you don’t need to be physically able to access the every device out there. It is desirable to minimally have one iOS and/or one Android device for testing. If you are targeting popular iOS devices (iPhone, iPad) it’s pretty hard to get around the fact that you need to get a Mac. Apple tools are only for Apple computers, like Microsoft mobile tools are only for the latest Windows 7. There exist generic remote testing services for mobile phones, but they often are costly and not a substitute for the real thing. Warning: Do not use browser+<iframe>-based “mobile simulator” or whatever crap web search throws on you. These so called simulators are usually pitiful attempts to grab web traffic for ad money without actually adding any value to testing. Running <iframe> based simulator in your web browser is simply the same as opening the page in your desktop web browser directly, with the window size shrink. Typing on the mobile devices is cumbersome. Use URL shortening services like bit.ly to shorten your test page URLs, so you can type them in faster on touch screen or keypad. If you need to alter HTML code or main CSS when mobilizing a legacy website you still want to see that your HTML changes did not introduce issues on the desktop browsers, especially older and problematic Internet Explorers. Here are some desktop testing resources, but I’d hope to hear of more pointers and services so please comment. How to automatize the installation all Internet Explorers on OSX and Linux using VirtualBox and one liner shell script. Please refer to this Smashing Magazine article for list of cross browsing testing tools. It is cumbersome to enter any longer input on mobile devices with “thumb typing”. For better mobile user experience you want to optimize form inputs to have minimal amount of presses. Also, the form layout might need adjustments to cope with the smaller screen size and harder-to-read text. In the case we describe in this tutorial, we use mobile.css to override the default desktop form styles so that the form renders and acts better on small screens and touch devices. Make text bigger: Text and <input> field default size is bigger, so that you don’t need to zoom in to read the label. Use fixed width font on input fields: Fixed width fonts, like Courier, are cleaner for reading narrow letters, like i,1,l on small input fields. It may look ugly, but it’s minor usability win. Only one column of form elements: There is only one column on <input> and no <form> elements are horizontally on the same row, so that there is as much as possible horizontal text line length to be consumed for <input> fields. Exception: make sure that checkbox control + label still remain on the same row. // Remember selection permanently and bypass the WAYF service from now on. // Select: In order to access the resource you must authenticate yourself. It is also recommended to convert <input type=text> fields for HTML5 specific versions. Note that this change is backward compatible, as the legacy browsers will fallback to normal text input. Even big sites like Amazon.com are already using HTML5 inputs. With specific HTML5 input types a mobile browser can open a field type specific touch keyboard. E.g. if you are asking for a phone number the opened keyboard is phone keypad instead of QWERTY touch keyboard. You can use HTML5 geolocation API to determine the city / address of the user and pre-fill form values based on this. This is handy e.g. on a use cases like where the user is selecting city to choose a movie theaters. iOS devices, like iPhone and iPad, do not support <input type=file> file submissions (iOS 5.0). Android devices do and other mobile phones as well. However, the user experience of selecting files on these devices is not great and you might want to create an app instead. Co-operative image resizer on the front end web server: when HTML is written from a template the image tags are written in such a way that <img src> attribute points to a resized image. The resizer rewrites image to match the vrowser screen dimensions. This is done e.g. in Web and Mobile for Plone CMS. In this blog post we mostly discuss about the simplest approach: resizing images using CSS only. If your responsive layout includes images, as contentish or style elements, they might not work well with small screens as is. You can fix the situation by resizing the images dynamically with CSS. You can also resize images dynamically on the server-side, so that mobile browsers load the reduced size version, saving the precious mobile bandwidth. However, this adds additional server-side component to the mix, increasing the complexity of the solution and especially when dealing with legacy sites consider whether the improved user experience is enough to balance this trade-off. Also, the dynamic image resizer component is easily subject to denial of service attack because the HTTP responses it serve are usually slow and computationally intensive. If you decide to use one of these components be sure you are aware of these implications.